When you send cold emails for your outbound sales many a times your email goes to SPAM. This happens for reasons which are sometimes in control and sometimes beyond our control. Let's just focus on things that we can monitor and control and avoid our cold emails lending up in SPAM box. If you send 100 emails and only 10 out of them are getting opened it means either you are not targeting the right companies for your sales campaign or most of your emails are going in SPAM. If you send a random email to someone who is least likely to buy your product then your emails will not get enough open rates and a lot of these prospects will mark your email as SPAM. To avoid that always have a good B2B targeting quality list and have a well defined ideal customer profile in mind. This can also mean that your email subject line is not good enough for your prospect to open your emails. Having some good cold email subject lines can help you improve your open rates. Once you passed the open rate test next step is to monitor your response rates. Some one has opened your email but they cant find your email cop y to be interesting enough to reply you. You may not be addressing their problems and only focussing on selling your product which can be one of the reasons for not getting enough reply rates on your b2b campaigns. If you are getting poor response rates then chance are that most of them are also marking your email as SPAM because they are not finding your emails relevant. Focus on good cold email templates and have a well defined Ideal customer profile and have a strong reason on why that person is your ideal buyer. If lot of your prospects are marking your emails as SPAM then its a bad sign for your company domain health. Your domain will be flagged by lot of blacklists and your emails will not get delivered and you will lose out lot of business because of that. You will even get low ranking on google search engine results. In order to check whether you are being marked as SPAM and if you are present in any blacklist, you can use this free email blacklist checker tool. 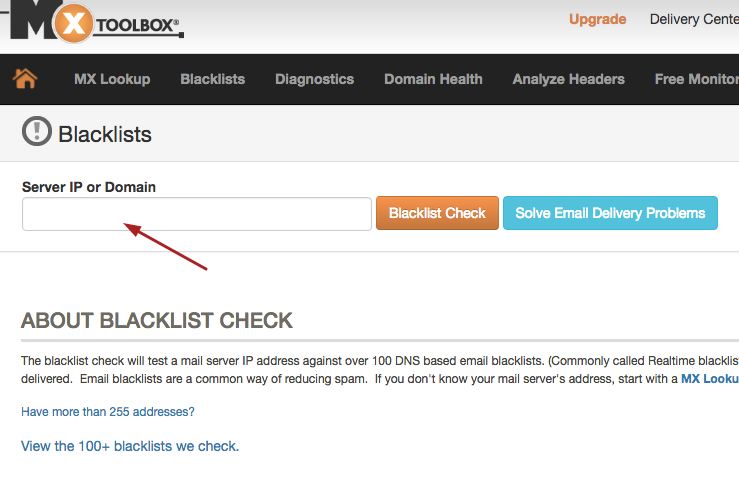 Enter your email domain as shown in picture below and it will show results on if you are being included in any of the blacklists or not and what steps your can take to remove yourself from the blacklist.